Being nocturnal mammals, most bats lack the requirement for acute vision. The data we have suggest many species have fairly good vision and may even use this above echolocation in some cases – they certainly aren’t blind. Fruit bats, in particular, have good colour vision that they use to help them locate and choose fruit. The short answer is: no. Indeed, while most bats (i.e. the microbats) have monochromatic vision (are colour blind), some (i.e. megabats) may see in colour. Flying foxes (megabats) have exceptionally large eyes, and—considering the lack of feeding-orientated echolocation in these bats—vision obviously plays an important role in finding food, avoiding obstacles and perhaps finding a mate. Royal Melbourne Institute of Technology biologist Mal Graydon published a fascinating summary of fruit bat vision in the June 1997 issue of Friends of Bats newsletter. In his article, Graydon notes that flying foxes can very easily adapt to their daylight surrounds, a skill afforded by the rapid contraction of the iris. Studies by the esteemed scientist Gerhard Neuweiler during the 1970s concluded that fruit bats have a visual acuity far superior to ours in dim light. Moreover, it seems that the “bob and sway” observed in flying megabats may be related to “two-eye analyses”. Using both eyes when assembling information about a visual target allows the brain an opportunity to compare two sets of information about the object (one from each optic nerve) and produce a final image that is more accurate with respect to textures, distance and shape. Assessing the presence of colour vision in animals is tricky, and normally relies on a combination of retinal scans and psychological tests. Humans have two types of cells on their retina: rods and cones. Rods are used to detect changes in light levels and contrast (i.e. serve a monochromatic function), while cones are used to collect and transmit information about colour. Rods and cones have been documented in many different species and are, generally speaking, considered to have much-the-same function across the species barrier. In fruit bats, the retina is almost entirely covered with rod cells. Strewn in amongst these rods, however, are cells that don’t look entirely rod-like, nor do they look entirely cone-like, although they look more like cones than rods. The number of these cells on the retina is minor, but it does leave the question of whether megabats have full colour processing ability open to debate. More recent studies on the retina of two megabats by a team of eight scientists, led by Daryi Wang at Academic Sinica in Taiwan, has revealed that these bats have the gene associated with detection of red light, which the researchers suggest might aid the bat in discriminating between fruit and foliage. Ergo, the results suggest at least some colour processing by these fruit bats. The role that echolocation plays in object avoidance and hunting in the microbats has reduced the need for high visual acuity. Consequently, with few exceptions, microbat eyes are proportionally smaller than their megabat kin and their roughly spherical lenses suggest a short focal distance, good depth of field and probable hyperopia (far-sightedness). 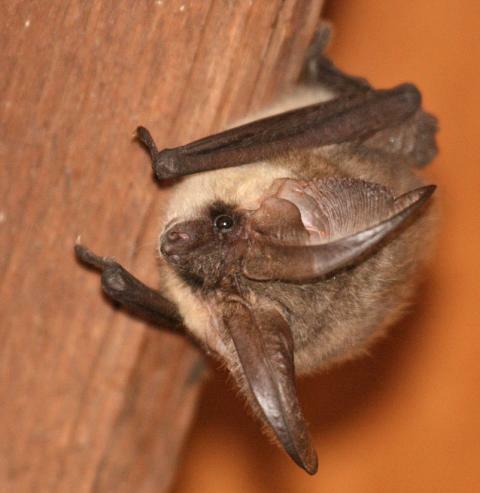 A series of experiments by the late Martin Eisentraut in the 1970s found that brown long-eared bats (Plecotus auritus) could discriminate different coloured targets, but not different shapes (i.e. they could tell the difference between black squares and white squares, but not a circle and a cross). Eisentraut’s experiments were, however, carried out in bright light, which may have affected the outcome. 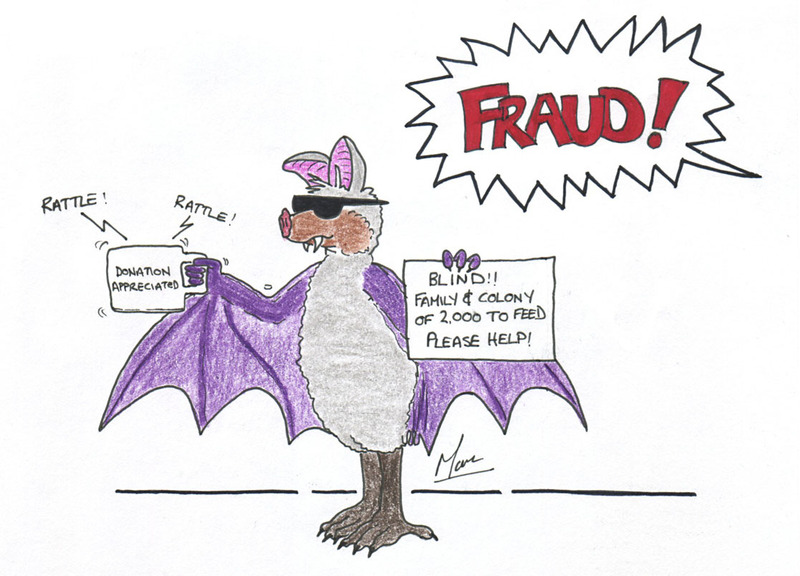 Various studies have revealed that bat vision works better in dim light and studies on phyllostomid (New World leaf-nosed) bats, by Roderick Suthers and his co-workers, in the late 1960s and early 1970s revealed more sophisticated discrimination of patterns in these chiropterans. Intriguingly, papers in the journal Animal Behaviour in 1981 and 1983 looking at the escape behaviour of the Geffroy’s tail-less bat (Anoura geoffroyi), reported that this microbat used visual cues alone when selecting an escape route from the experimental setup, discarding acoustic cues. The above studies and on-going experiments on microbats suggest that they may rely on vision more than was originally considered. A fascinating study by Johan Eklof of Goteborg University in Sweden and Gareth Jones at Bristol University published in Animal Behaviour during 2003 revealed that visual cues were more important than acoustic ones to foraging P. auritus. The scientists even found evidence for spatial memory in their subjects – the bats were observed to hover over places where dishes of worms were once placed but had subsequently been removed, suggesting that they remembered that there had once been food there. Elkof and Jones observed more feeding attempts at dishes that provided only visual cues, compared with those that provided only sonar cues, suggesting that not only were the bats able to locate food by sight, they also seemed to ‘prefer’ using visual cues rather than acoustic ones. More recently, it has become clear that many bat species seem to have a sensitivity to ultraviolet (UV) light, which is more abundant at dawn and dusk. Indeed, York Winter at the University of Munich in Germany and two of her co-workers were able to demonstrate that the long-tongued nectar bat (Glossophaga soricina) is sensitive to UV down to a wavelength of 310 nm. York and her colleagues—Jorge Lopez at the Universidad de San Carlos in Guatemala and Otto von Helversen of Erlangen University in Germany—also conducted behavioural experiments that revealed a sensitivity in the green (max. 510 nm) and UV (above 365 nm) spectra. Moreover, the team found that the same photoreceptor (light-sensing cell) is responsible for both peaks (i.e. in the green and the UV) – this is interesting because in all rodents and marsupials (pouched mammals) where colour vision has been established, there is a separate receptor to deal with UV light. Indeed, the mechanism described for UV vision by Winter and his co-workers has never been demonstrated in intact mammal visual systems before!